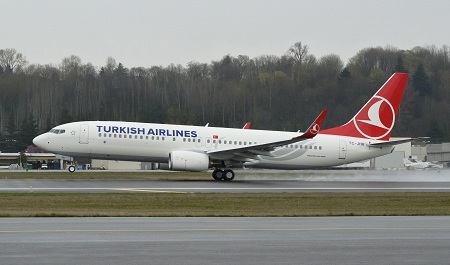 ISTANBUL, April 28, 2014 – Boeing (NYSE:BA) and Turkish Airlines celebrated the Turkish flag-carrier’s 75th direct delivery of a Next-Generation 737 airplane. The 737-800 arrived at Turkish Airlines’ base at Istanbul’s Ataturk Airport on Saturday and is the latest addition to the Southern European carrier’s growing fleet of more than 100 Boeing airplanes. ISTANBUL, April 29, 2014 /PRNewswire/ -- Boeing (NYSE:BA) and Turkish Airlines celebrated the Turkish flag-carrier's 75th direct delivery of a Next-Generation 737 airplane. The 737-800 arrived at Turkish Airlines' base at Istanbul's Ataturk Airport on Saturday and is the latest addition to the Southern European carrier's growing fleet of more than 100 Boeing airplanes. "As one of the world's fastest growing airlines we are delighted to be taking this meaningful delivery from Boeing. Turkish Airlines, which has reinforced its position and energy with significant investments and growth figures, continues its expansion," said Dr. Ahmet Bolat, Turkish Airlines' chief investment and technology officer. "The 75th direct delivery of a Next-Generation 737 airplane is proving one more time the success of our strong collaboration with our permanent partner, Boeing." The Next-Generation 737-800 forms the largest component of Turkish Airlines' single-aisle fleet, which is also complemented by Next-Generation 737-700s and 737-900ERs (Extended Range). The 737-800 is the best-selling version of the highly successful Next-Generation 737 family and currently the most technologically advanced airplane in the single-aisle market. This latest delivery comes just weeks after Boeing celebrated the 8,000th 737 delivery. "Turkish Airlines' short-haul fleet is built upon the impressive economics, reliability and comfort of the Next-Generation 737 family," said Todd Nelp, vice president of European Sales, Boeing Commercial Airplanes. "This delivery marks a significant milestone in the strong relationship between our two companies that spans half a century. We look forward to marking the next 75 737 deliveries with Turkish Airlines, which will include our latest and most advanced single-aisle offering, the 737 MAX." Turkish Airlines' latest 737-800 also features some of the first galleys manufactured by Turkish Cabin Interiors (TCI). TCI is the first Turkish aerospace company to design, manufacture and certify products for the commercial aviation market, paving the way for the ongoing development of aerospace capabilities in Turkey. "In cooperation with Boeing we have developed many innovative projects in varied fields of the commercial aviation sector – the most recent being the development of TCI for cabin interior design," said Dr. Bolat. "We worked meticulously in every process of this huge project by taking the valuable support of Boeing. We hope to continue making such breakthroughs together with our valued partner." Last year, Turkish Airlines reaffirmed its commitment to the 737 family by ordering 40 737 MAX 8s, 10 737 MAX 9s and 20 Next-Generation 737-800s, valued at $6.9 billion at list prices. The order was the largest Boeing order in Turkish Airlines' history. Turkish Airlines currently serves 247 cities in 106 countries around the world. Currently operating more than 100 Boeing airplanes, including Next-Generation 737s and 777-300ERs (Extended Range), Turkish Airlines has nearly 100 airplanes on order from Boeing.